Only at Danamon will you enjoy the widest selection of credit cards tailored to your unique lifestyle. 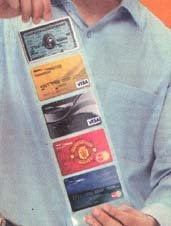 The modernity and exclusivity of the American Express Card, the endless cash back benefit from Danamon Card VISA and MasterCard, the lifetime opportunity to fly to England and watch your favorite soccer team in action with Manchester United Card, as well as Indonesia’s first sharia credit card, the Dirham Card. Best of all, these cards are welcomed at millions of merchants worldwide, so that you can enjoy life to the fullest. Please visit www.danamon.co.id or Danamon Access Center: 021-34358888 (Jakarta), 022-4211188 (Bandung), 024-3581888 (Semarang), 031-5346999 (Surabaya), 0361-243888 (Denpasar), 061-4579999 (Medan), 0542-730003 (Balikpapan), 0411-334555 (Makassar).